to control these microorganisms in water. significantly reduce chemical addition, such as chlorination. as well as a retardation of membrane fouling can be realized. tradition-ally employed to desalt or remove hardness from groundwater. it is used primarily for removing particles and microbes and can be operated under ultra low pressure conditions. 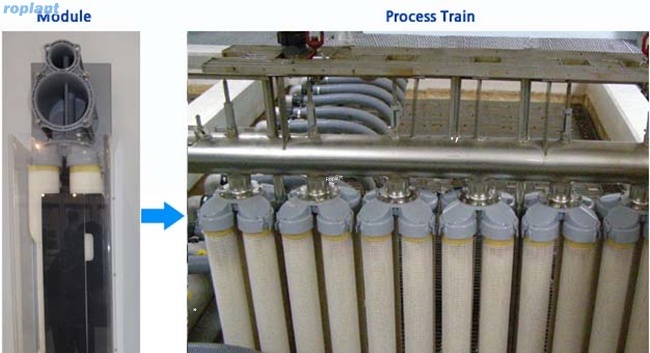 • In the simplest designs, the MF process involves prescreening raw water and pumping it under pressure onto a membrane. cases, the cake layer built up on the membrane during the water production cycle can remove some organic materials. conditions, appear to act as an absolute barrier to selected bacteria and protozoan cysts and oocysts. chloramines; however, long contact times are required to inactivate viruses. • Process and plant compactness;and o Simple automation. ▶ Fouling is the limiting phenomenon responsible for most difficulties encountered in membrane technology for water treatment. which should be thoroughly researched in order to have a better understand-ing of this phenomenon and its mechanisms. • UF is a single process that removes many water-soluble organic materials, as well as microbiological contaminants. concentration levels, do not apply. However, it may be necessary to adjust the pH to decrease the solubility of a solute in the feed so that it may be filtered out. • UF is designed to remove suspended and dissolved macromolecular solids from fluids. of the many uses for UF membranes, pilot studies are normally conducted to test how suitable a given stream is for direct UF. (membrane fouling during the backwash procedure). oxidants, such as chlorine, chlorine dioxide, ozone, or potassium permanganate. the water to remove NOM and, consequently, decrease the surface of membrane needed.